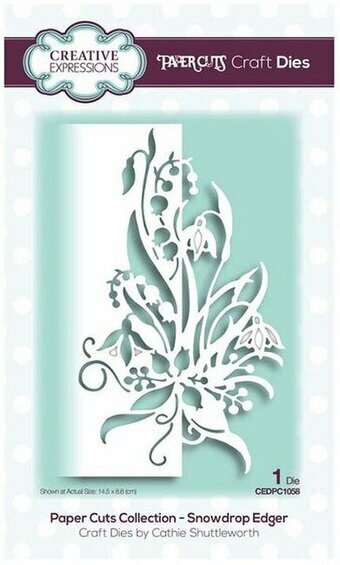 Memory Box craft die featuring lily of the valley flowers inside a floral frame. 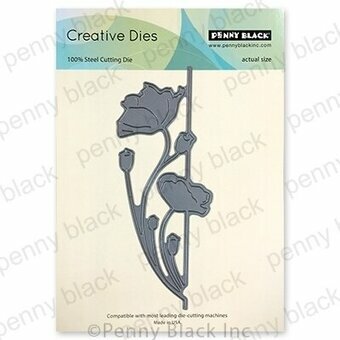 Penny Black Craft Die featuring a poppy flower. This is a set of six separate dies wired together, they can be separated by snipping the wires. The entire hollyhock measures 2.5 x 4.625 inches. Designed by Alesa Baker Designs. These dies are compatible with most tabletop die cut machines. 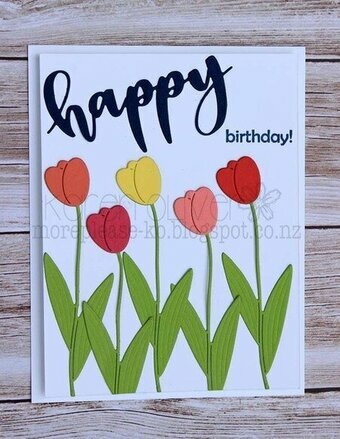 Our Dainty Tulip die is just the right touch for Spring cards, sympathy cards, or any other occasion. Cut just one for a simple card, or a bunch for a full bouquet! Approx. size: 1.125" x 3.7"
Penny Black Craft Die featuring flowers and a vase. 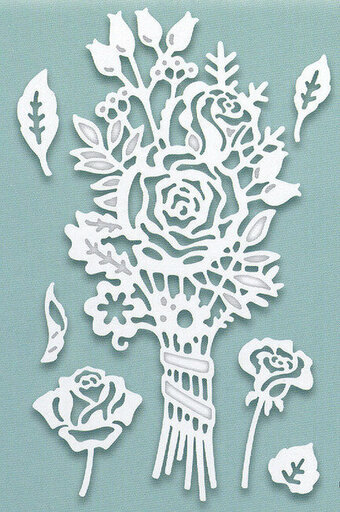 This craft die by Cathie Shuttleworth cuts a beautiful edger that is 6 inches long. This die is 1 piece and cuts the design on only 1 side while reverse cutting on the other. 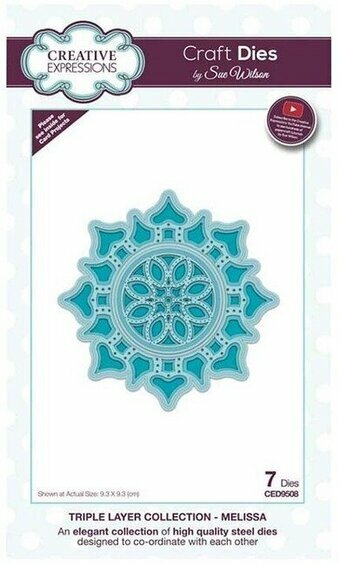 This allows you to create a beautiful edge to your cards and other paper craft projects. Includes 1 die. Size: 3.5in x 6in. 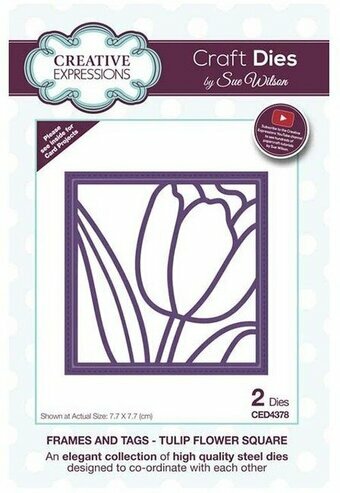 Create realistic tulips with this die set. 8 pcs. Size: tulip 5.5 x 2 inches. Build your own 3D sunflower by layering cuts from these three dies. 3 pcs; flowers: 1.8 x 1.8in, 1.6 x 1.6in and 1.4 x 1.4in. 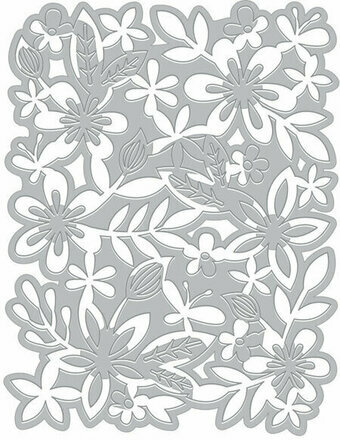 Add a nature theme to your craft projects with this 4.25 x 5.75-inch flowers and leaves embossing folder. 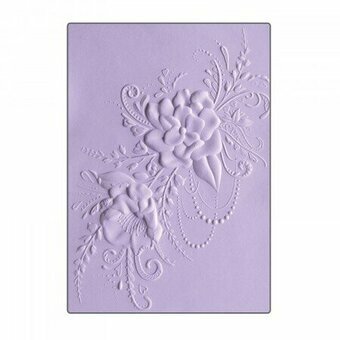 It's ideal for embellishing heavyweight card stock and works with most embossing machines. Craft die featuring a border with flowers. 1.3 x 5.2 inches. Memory Box craft die featuring a poppy flower in a circular frame. 2.5 x 2.5 inches. 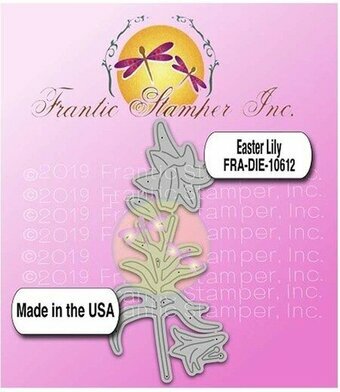 Frantic Stamper Precision Die - Boho Flowers. This is truly a gorgeous set of geometric flowers you will find yourself using again and again. 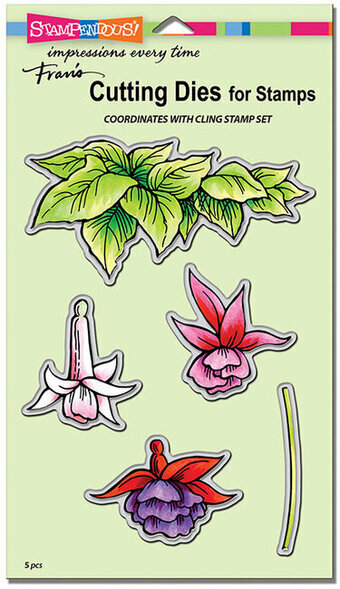 With two flowers, two leaves and a stem, you can mix and match the pieces in unlimited combinations. The designs are lacey and open. But here's the fun part: they match the Grateful Florals Outlines die set as well! (FRA10261). Be sure to use both dies together for even more combinations!! The large flower measures 2"x2", and the half-flower meausres 1.875" x 1.125". The leaves measure 0.6" x 2.2" and 0.875" x 1.55". The stem die is 2.5" long. 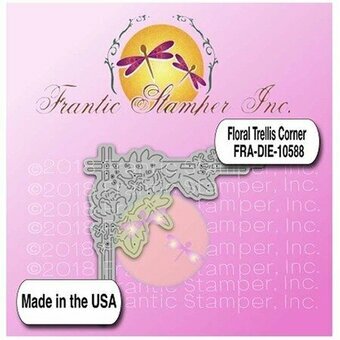 Our Frantic Stamper Precision Dies work in most consumer table top die cutting machines such as the Cuttlebug, Big Shot, Vaggabond, Boss Cut, and Grand Calibur. Some dies may require the use of a metal shim depending on your machine. These are US-made steel dies compatible with most table-top die cutting machines. This is a set of 3 dies. The flowers measure 1-3/4, 2-1/4, and 2-3/4 inches in diameter. Creative Expressions: Paper Cuts Collection Autumn Posy. A great autumn posy die set which includes a bouquet as well as additional elements that can be used to create 3D effects with the bouquet. 7 dies. Size: Smallest: 0.35" x 0.35", Largest: 1.90" x 4.0". Sue Wilson craft dies featuring Poppy flowers. 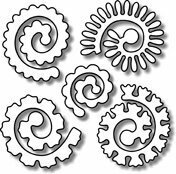 Designed by Sue Wilson these cutting dies are an elegant collection of high quality steel designed to co-ordinate with each other. Contains 13 dies. Size: Smallest: 0.25" x 0.25", Largest: 1.75" x 1.75". Craft die featuring a vine with flowers on a cottage. Memory Box/Poppy Stamps craft dies are made of 100% steel. For use on cardstock, felt, and fabric. Cut, stencil, emboss, create! Use in most leading die cut systems. 3.2 x 3.1 inches. This is a set of ten separate dies wired together, they can be separated by snipping the wires. The tulips measure .25 x 1 inch. These dies are compatible with most tabletop die cut machines. Approx size: 2.75 inches x 2.25 inches. A sweet informal birthday greeting. 100% steel craft die from Memory Box. For use on cardstock, felt, and fabric. Cut, stencil, emboss, create. Use in most leading die cut systems. 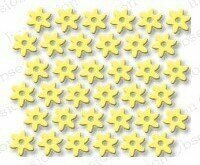 1.4" x 4.2" flowers (3.6 x 10.7 centimeters). This is an exclusive Heartfelt Creations Die manufactured by Spellbinders and will work with most manual die cutting systems. 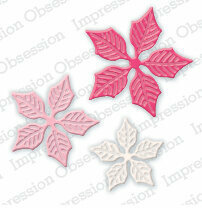 We recommend you purchase the Arianna Blooms PreCut Set to compliment these dies. 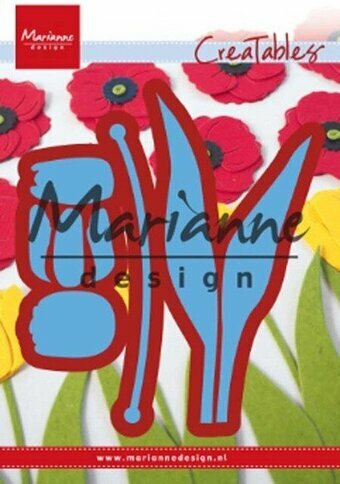 Creating dimensional flowers has never been easier. 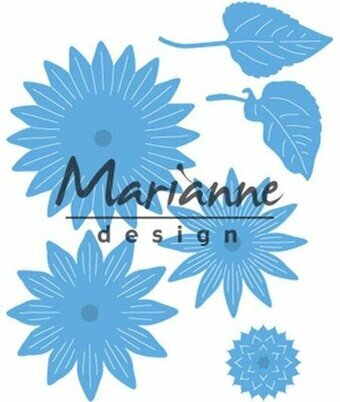 The Arianna Blooms die is designed to cut 5 flowers with one pass through your cutting machine. The trio of stamen dies in this set allows you to add realistic centers to your completed blossoms, or use as starburst accents on your page. Approx. Die Template Sizes: 1. Arianna Blooms: 4.25" x 3.75", 2. Large Stamen: 2.25" diameter, 3. Medium Stamen: 1.5" diameter, 4. Small Stamen: 1" diameter. Memory Box/Poppy Stamps craft dies are made of 100% steel. For use on cardstock, felt, and fabric. Cut, stencil, emboss, create! Use in most leading die cut systems. 0.6" x 2.4". The perfect addition to your next paper craft project! This package contains 23 6x6 inch double-sided sheets. 170 Gr. Finishing Touches - Petite Forget Me Nots. 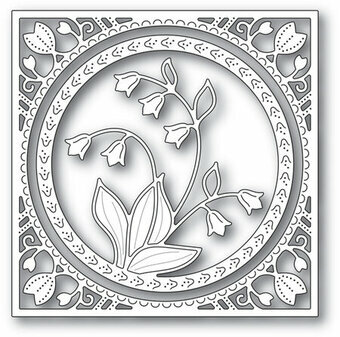 Creative Expressions Craft Dies by Sue Wilson form an elegant collection of high quality steel dies designed to co-ordinate with each other. 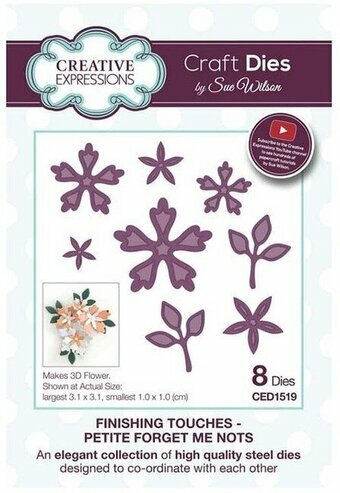 Layer these dies to make 3D flowers. Includes 8 cutting and embossing dies. Size: (largest) 1.2 x 1.2 in (smallest) 0.4 x 0.4 in. The Floral Trellis Corner is a beautiful and quick way to frame a sentiment. We designed this die so that it can be used in any corner, top or bottom, right or left! Approx. 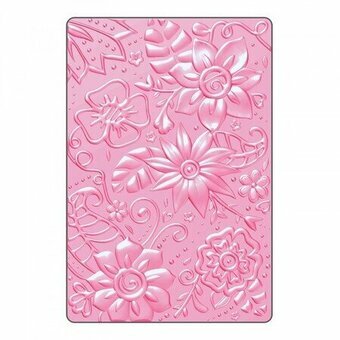 size: 3" x 3"
Craft die from Stampendous featuring beautiful flowers and leaves. 5 precision dies that cut right on the edge of the stamped designs. Large leaf die measures approximately 4-1/2" X 2-1/4".